The only real change to my pizza process is the fact that I now make my own dough. I used to harbor and incredible hatred for yeast, but the introduction of instant yeast in my life turned that sentiment around 180 degrees. Now I jump at the chance to throw some flour, yeast, salt, water, and oil into the mixer to effortlessly knead. 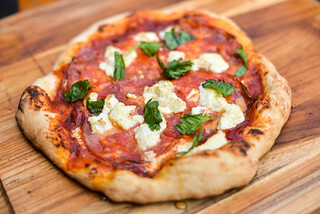 Then a 3-day slow rise in the fridge seems to work without fail, creating a wonderfully stretchy pizza dough that hasn't failed me yet at the grill. Since it's been more than a few years, it's worth a refresher on the basic pizza grilling process. It's starts with the stretched dough, which gets a light coating of oil mostly for insurance against sticking to the grate. The oiled side of the dough then goes down over the high heat side of a two-zone indirect fire. 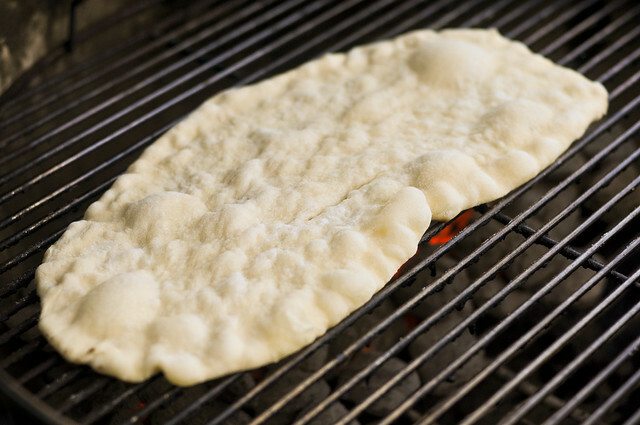 It only takes a couple minutes for dough to crisp and brown on the underside, and bubble on the upside, at which point, it's ready to be taken off the grill to get topped. I prefer to remove the half-cooked dough completely off the grill, otherwise I feel too rushed arranging my toppings while the dough is still cooking, which leads to anxiety, which often ends in pizza disaster. With the pie safely away from the heat, I can transform it into a piece of art on my own time. Once toppings are arranged, the pie gets slipped back on the grill, this time on the cool side, and covered. 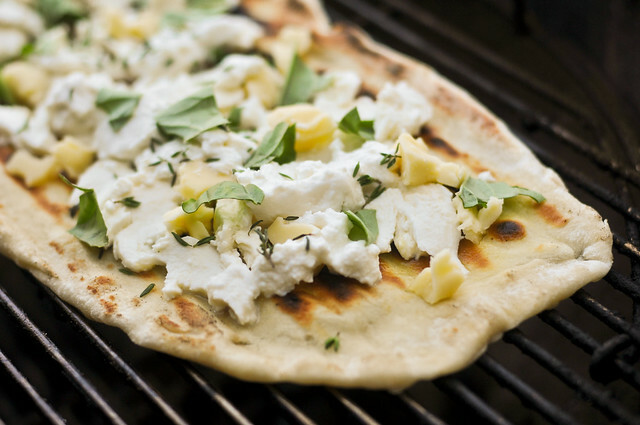 Depending on the heat of the grill, it can take anywhere from 5 to 7 minutes for the cheeses to melt and the dough to finish cooking. 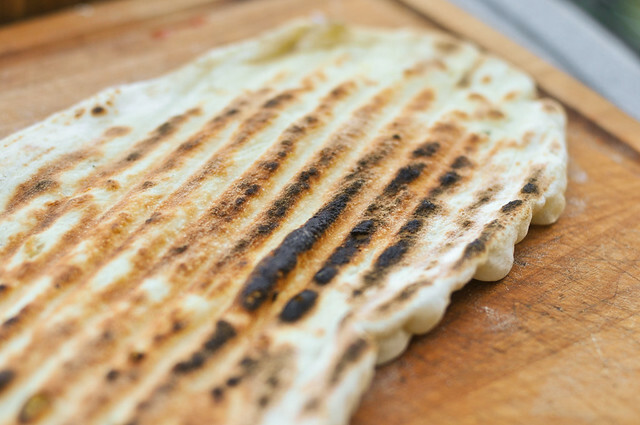 If the toppings are done before the dough, simply slide the dough back over to the hot side of the grill until it finishes up. Sometime I do this no matter the state of toppings, just get a little extra crunch and char on the dough. When I said the pie is a piece of art, I meant it for this white beauty. 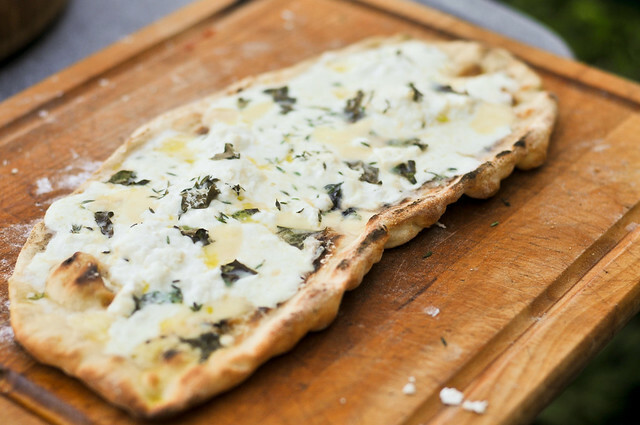 I've been playing with different white pizzas and have come up with a personal favorite—fresh mozzarella forms the base, with Italian Fontina adding another smooth flavor, then Parmesan provides a little robustness, and ricotta an irresistible creaminess. A light sprinkle of fresh herbs in the way of thyme and basil easily stands out amongst the mostly mellow cheeses, and a drizzle of a good extra-virgin olive oil is the icing on the cake. Although my pizza grilling process hasn't changed in years, the time has afforded ample opportunities to toy with toppings, leading to some really great combos such as this and much more...breakfast pie with hash browns, cheddar, and sausage anyone? 1. 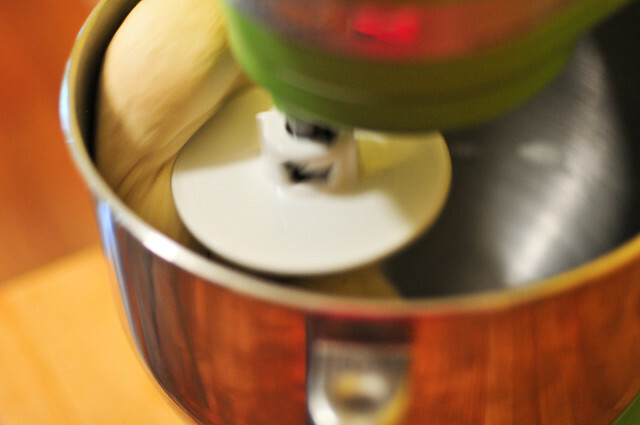 To Make the Dough: In the bowl of an electric mixer, whisk together flour, salt, and yeast. Add in oil and water and mix on low speed with paddle attachment until combined. Switch to dough hook and knead on medium speed until dough clears sides, but sticks to the bottom of the bowl, 5-7 minutes. Turn dough out onto lightly floured surface and divide into 6 equal pieces. Transfer to a parchment paper lined baking sheet, brush lightly with olive oil, cover, and place in refrigerator for at least 1 day, up to 3. 2. 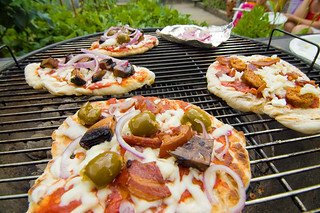 To grill the pizza: Remove dough from fridge 1 1/2 hours before lighting the fire. Light one chimney full of charcoal. When all the charcoal is lit and covered with gray ash, pour out and arrange the coals on one side of the charcoal grate for indirect cooking. Clean and oil the grilling grate. 3. 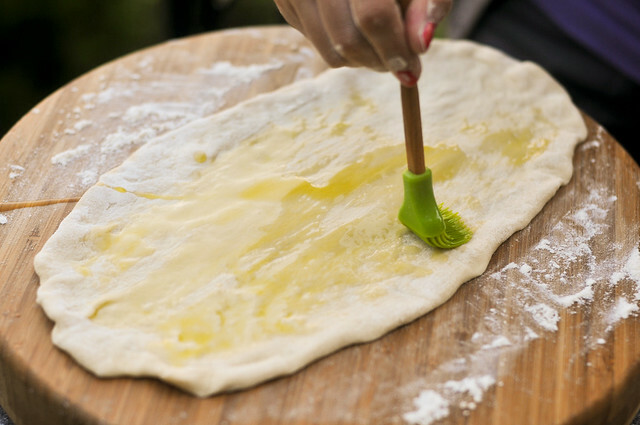 Stretch dough out to long oval or rectangle on a surface dusted with semolina flour or cornmeal. Lightly brush dough with extra-virgin olive oil and place on hot side of grill, oiled side down. Cook until bottom is browned and crisp and top side starts to bubble, 1-2 minutes. Remove dough to plate, cooked side up. 4. Sprinkle pie with mozzarella, Fontina, Parmesan, thyme, and basil. Drop on small spoonfuls of ricotta and drizzle with oil. 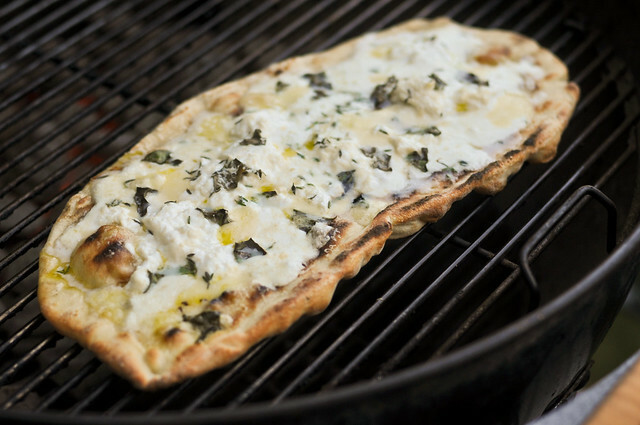 Place pizza on cool side of the grill and cover. Cook until cheeses are melted and dough is cooked through, 4-7 minutes. Remove from the grill, slice, and enjoy. Repeat with remaining dough, there should be enough cheese and herbs for up to 6 small pies. Thanks for the inspiration! Pizza is my most favorite food ever and I've been giving my Emile Henry pizza stone a major workout during the cold months. It's time to move the pizza party outdoors! Nice pie there! Love the cheese variety. I'm definitely going to make a lot more pie on the grill this summer. I've always done my pizzas indirect in our Eggs but this makes me want to try one indirect. 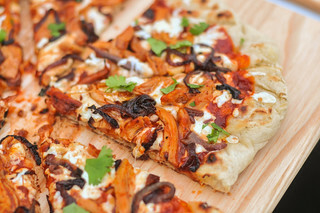 And alfredo style pizzas are my wife's favorites, so I have to try this! I, too, am a yeastophobe, and would like this recipe to be my maiden voyage! I want one (or two) normal size pies, not six minis. Does this change dough rising time? I don't visit this site often, so please email me if/when you've answered. Thanks!